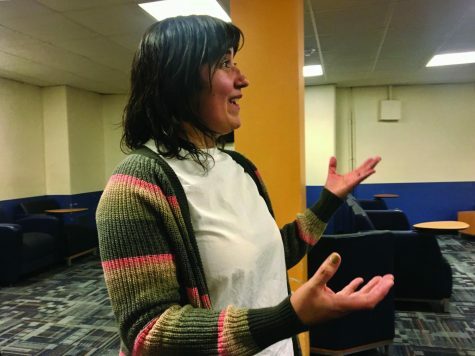 On March 14, Northeastern Illinois University received the guest speaker Mago Torres, who is a Mexican journalist, researcher and scholar that contributed to Panama Papers as a Fellow in JSK 2018. Organized by The Independent Newspaper, Que Ondee Sola Magazine and the WZRD radio, the talk that started at 5:30 p.m. was part of Meet the Media Night and united the students from Communication, Media and Theatre and Music and Dance departments in the Main Campus. One of the principal topics was Torres’ career, her focus on the right to information and data journalism and her contribution to the leak of 11.5 million documents about irregular activities from offshores companies, also known as the Panama Papers. As stated by her, being a part of this was possible because she was studying in the John S. Knight Journalism (JSK) program at Stanford University in California, where she spent 10 months with 17 journalists from Brazil, China, Cuba, Norway, Russia, Switzerland and the United States. “Learning about collaboration in our profession was important during this investigation with the group, once there was a lot coming out in the news”, says Torres. Torres also talked about the differences between the Mexican and American Freedom of Information Act (FOIA). “It’s easier to get information in my home country because you don’t need to be born there to request public records. You don’t need to introduce yourself, giving the government private information such as your home or work address — and that’s how it works in the U.S”, explains Torres. Besides that, the journalist who has been living in the U.S for four years introduced her latest piece named 2,000 Clandestine graves, which documents hundreds of grave-sites discovered across Mexico and is a part of the project A dónde van los desaparecidos. She said to students that they should follow their gut. “You need to trust in your curiosity. If you are curious about the work that a news organization does, find someone that works there that is on social media or email. Please, reach out to the source”, affirms Torres. Torres also co-founded Periodistas de a Pie (Journalists on Foot), which is an organization that seeks to raise the quality of the professional field in Mexico. In this group, she was able to investigate projects such as Masde72, a journalistic research site uncovering facts about massacres occuring in Mexico. Despite that, she coordinated and taught in the journalism program of Universidad Iberoamericana. She now lives in Chicago. Since February 2015, Torres has been freelancing and trying to help her home country through her stories and investigations.